I think Russia was the whole reason Stew let me book this cruise – he hadn’t really seemed keen on the idea of a cruise before, but Russia seemed to do the trick … Must be the Russian heritage he goes on about! 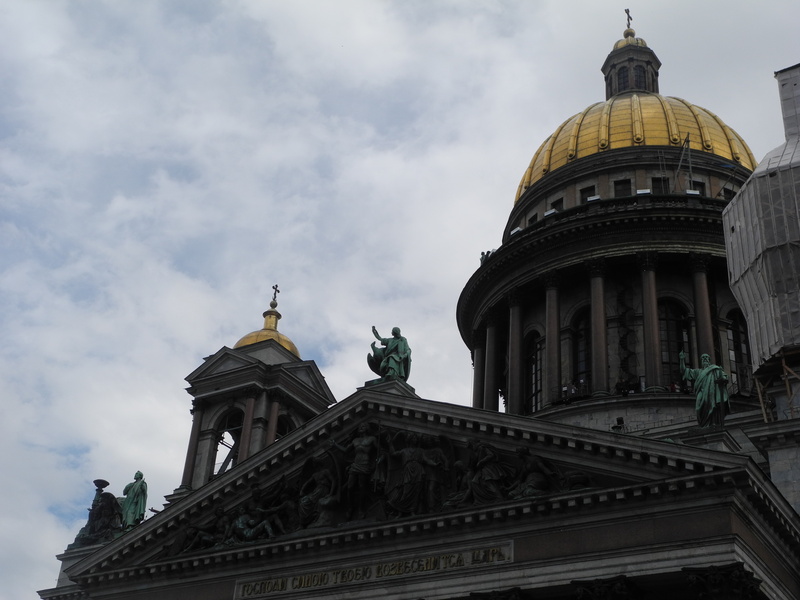 St Petersburg was the port he was most looking forward to, and the two-day stop was a standout feature of our holiday. It isn’t the easiest place to travel to, so visiting as part of the cruise was perfect – except that you can only leave the ship with a pre-organised visa, which would have set us back a few hundred pounds, or on a tour. Not being tour kind of travellers (we prefer to wander around and do our own thing), this was the only one we booked over the two-week holiday. But it was worth it to see all the main sights of the city. 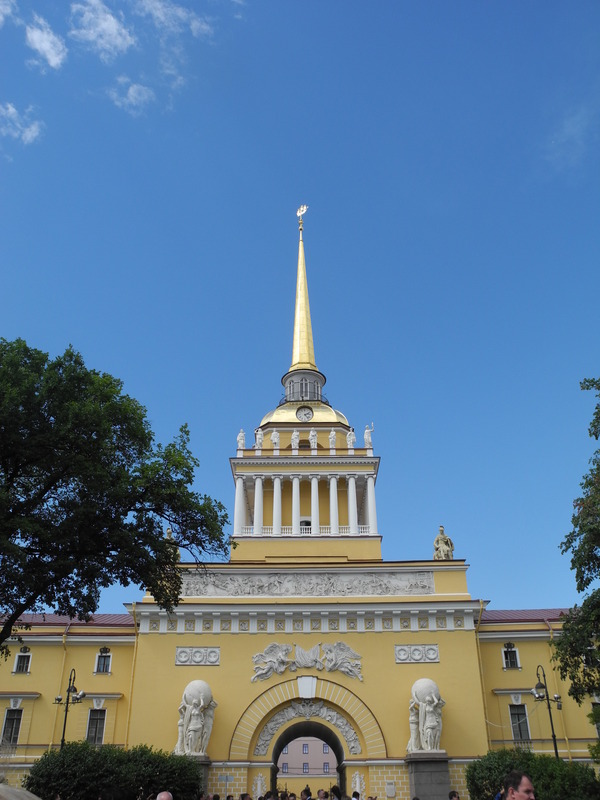 There were so many options to choose from – two-day trips, evening excursions to the Russian ballet, or a five-hour tour, which we went for as a full nine hours would probably have been a bit much with a one-year-old in tow. 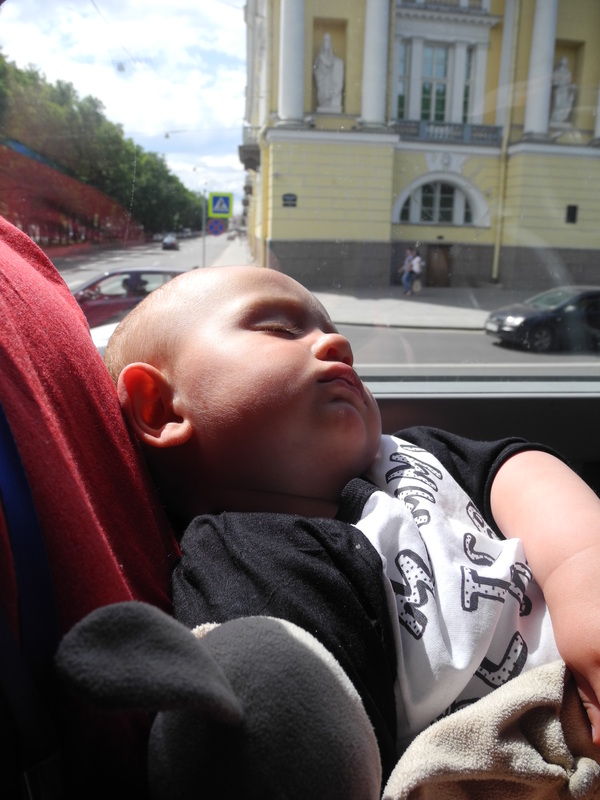 We booked an afternoon tour so we wouldn’t all have to get ready and off the ship by 8.30am … but it did mean Santi fell asleep before we even got off the bus! The ship had docked outside the city, and on the way in we were faced with rows and rows of enormous high-rise blocks of flats – with even more being built. This didn’t fill me with hope as I was already a bit anxious not knowing what to expect. But as we got closer to the centre the scenery changed and there were so many beautiful buildings to look at – and of course familiar looking signs to point out, like Burger King in Russian. 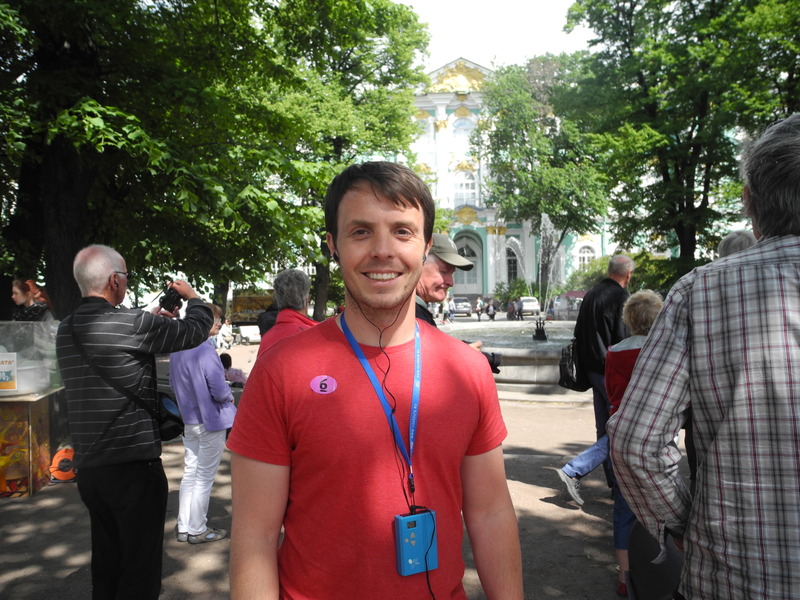 We were dropped off near the Winter Palace and Hermitage Musuem, and walked to Palace Square, which sounds easier than it actually was as the streets were so busy and we clipped a few ankles with the buggy. It was a bit stressful trying to keep up while pushing Santi along, so I think a baby carrier might have been a better idea. The obvious highlight was the Church of the Saviour on Blood with its beautiful onion domes on top. We walked along the river to it, and stopped to watch a man with a huge bubble machine, which Santi enjoyed. It was a shame we didn’t get free time to walk around the church, but security had just been tightened in the country (UK staff weren’t even allowed to leave the ship) so I’m sure it was for the best … We just made sure we got enough snaps as we walked past. Best family selfie background ever! Before the end of the tour we were taken to a vodka shop (of course) and then to a little church where Santi could run around outside. 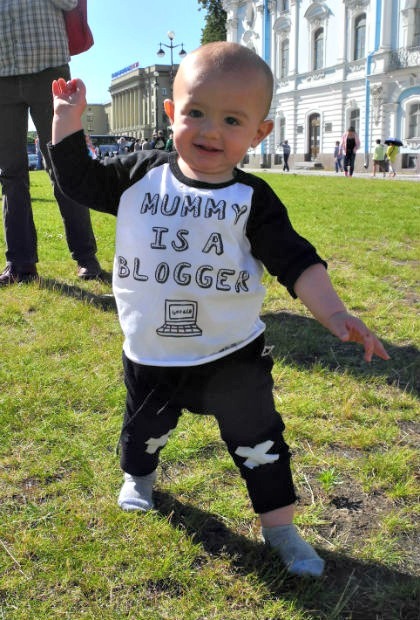 I don’t know if we were being sensible or overly cautious, but there was no way we were letting him walk on his own in the city centre! A very rare smiley photo of Santi … outside the vodka shop! Freedom! Not sure where his shoes were by this point! 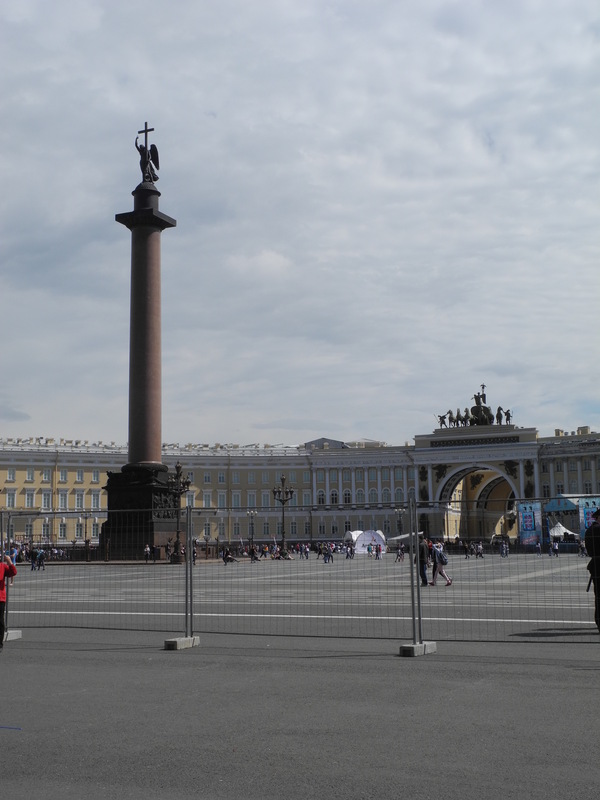 I’m sure there is enough to see in St Petersburg to spend way more than just one or two days there, but I feel like we got a taste for the city on our tour. I don’t think I’d be all that comfortable walking around with a toddler on our own, so I’m glad we didn’t invest in a visa. It turns out in this situation a tour was the perfect option. 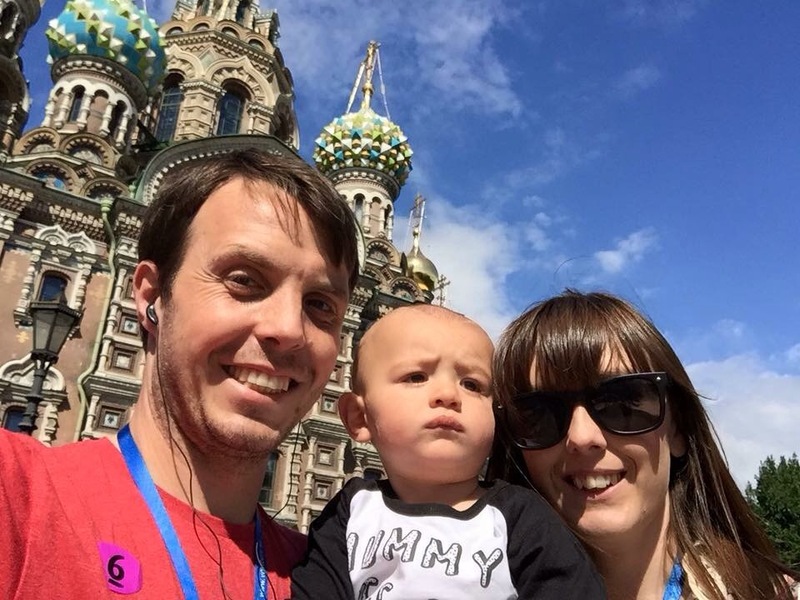 * If you enjoyed this, check out some of our other travelling adventures!